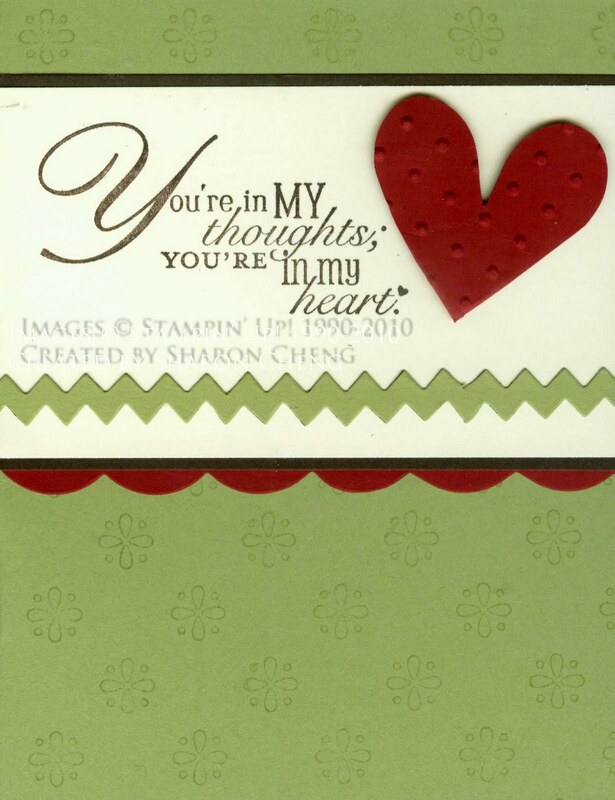 I made this card using the new Tasteful Trim die to make the rick rack and scallop trim. This is going to be one of my favorite dies because it can be used in so many different ways. I chose the heart to remind everyone about our Crop for a Cause on Saturday, Sept. 18th. Unfortunately, too many of us have a loved one affected by heart disease or stroke. As the leading cause of death in this country, cardiovascular disease claims almost as many lives each year as the next 7 leading causes of death combined. To help stop this, we are hosting a crop (our "team") to help raise funds that are needed for heart disease and stroke research and education and we're asking you to join us. Our team will be participating in this year's Start! Heart Walk fundraiser by Cropping for a Cause from 9 am – 9 pm on Saturday, September 18 at Central Christian Church in downtown Forth Worth. There will be door prizes, a couple of vendor tables, and a silent auction – all to benefit the American Heart Association. The more people we have working to defeat heart disease and stroke-the better, so please sign up today and get your projects organized! It promises to be a fun-filled and worthy day! Your $40 crop fee will go to the American Heart Association. To register for our crop, send an email to CropForaCauseFW@yahoo.com with your name and phone number and we will send you the registration form. But hurry, seating is limited to 50 participants! We hope to see you there! Here is how heart disease affects one of my co-workers at Baylor, Laura "Tiffany" Hartgraves. I recently began working for Baylor All Saints. I am a PCT on C5 Med/Tele. I created Team Harrison four years ago, in 2007. Team Harrison is in honor of our amazing four year old, Harrison . This is our 4th year to walk and our first year to walk with the Baylor family. Our little family was growing as we waited for the arrival of our precious baby boy and we couldn’t have been more excited! During a Level II Ultrasound we were informed that our unborn son would come into this world with multiple birth defects, with various congenital heart defects topping his list. At only eight days old, our baby, Harrison, went in for open heart surgery to repair his tiny heart. Although surgery was a success, it did create other medical problems that would affect Harrison the rest of his life. Throughout his recovery period, Harrison suffered mini strokes to both sides of his brain. Once he was extubated it was discovered that he had a paralyzed left vocal cord. Almost two months later, little Harrison came home on Christmas Day 2005; what an amazing gift for our family! He came home with a feeding pump and a long list of medication and he was only seven weeks old. After Harrison ’s first birthday we learned that he had mild cerebral palsy, secondary to the strokes. His cerebral palsy affects his speech. Harrison had his feeding tube removed during this year too. We were finally out of the woods and Harrison was playing like a typical toddler. When he was 2 he had an MRI at Cook Children’s Medical Center and, little did we know, the result would turn our world upside down. Harrison had an extremely low heart rate between 40 – 50 beats per minute. After only one night of observations on the Cardiac floor at the hospital we were told that he was in complete heart block and would need a pacemaker for the rest of his life. He was in surgery within the hour. On April 23, 2008 our little boy had another heart surgery to receive a dual chamber pacemaker. With the technology and research today, we upload Harrison ’s pacemaker activity bi-monthly. A broken wire was discovered after his first upload. On July 30, 2008 doctors had to go back in to replace a broken wire and retrieve the pacemaker that had slipped into his pelvic bone. Harrison now carries a card with his pacemaker serial numbers. With a non-stop life, in and out of the hospital, we can’t believe that Harrison is only 4 years old. And this year, Harrison was given the gift of communication; he received a communication device to help him communicate with us. His life is finally on cruise control with a healthy beating heart! Harrison’s experience led us to the American Heart Association. We created TEAM HARRISON to walk, united against heart disease and stroke, during the Tarrant County Heart Walk. 2010 will be our 4th year to walk. With each year, we have seen Harrison ’s energy level increase. Each year he gets stronger, and so does our family, thanks to the American Heart Association’s research that has helped keep Harrison alive. Maybe this will be his year to run a little! If you can't join us at Crop for a Cause, please consider donating to the American Heart Association via my Heart Walk website.